Story: Amok was born in the Stone Age. He lived peacefully with his family and tribe until one day they were attacked by a group of aliens wearing X-O armors. The aliens killed everybody except the man who became Amok who was left for dead. When he woke up, he found and attacked the aliens, killing two of the four in the group. Having lost the element of surprise, he was overpowered by the remaining two, one of which was the one who had killed his family. The two aliens were just about to kill him when the Unity arrived. The alien Malakai from Unity stopped the two aliens, killing one while the one who had killed Amok's family escaped. Malakai offered Amok the power to get his revenge provided he would hunt the enemy, even thru space and time. Amok accepted the offer and started hunting the alien and the X-O armor . Up thru time Amok kept hunting the X-O armor, never getting his revenge. He found the alien and the X-O armor but ended up being killed and revived later. The alien was killed some point, but the X-O armor was passed on to others . When Amok learned about the resurfacing of the X-O armor he sought it out and attacked Donovan Wylie and the armor. He didn't fare well in the attack and had to escape to fight another day . 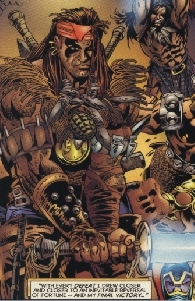 During Amok's second attack on Wylie, the Unity and Malakai returned . In the following fight between Wylie and Malakai, Amok discovered that he had been used and helped Wylie fighting the Unity [3-5]. Skills & abilities: Having fought for literally thousands of years, Amok was a master of hand-to-hand combats and use of weapons. Equipment: Amok possessed several weapons, like assorted swords, knives, guns and grenades. Among his weapons was the talisman, which kept him alive. The talisman, apart from keeping him alive, was also an energy sword.